Ten-year-old Bhavana Madini, a 5th grader at Plainview-Old Bethpage Middle School, takes the top prize and a chance to compete in May at the Scripps National Spelling Bee. In a fitting finale to the 2019 Long Island Regional Spelling Bee Wednesday, the championship word was "sophic" — a Greek-derived adjective defined by Merriam-Webster as "of, relating to or full of wisdom." And 10-year-old Bhavana Madini knew she could spell it. "S-o-p-h-i-c," said the fifth-grader from Plainview-Old Bethpage Middle School to applause inside the Pless Center for Performing Arts' O’Connor Hall at St. Joseph's College in Patchogue. 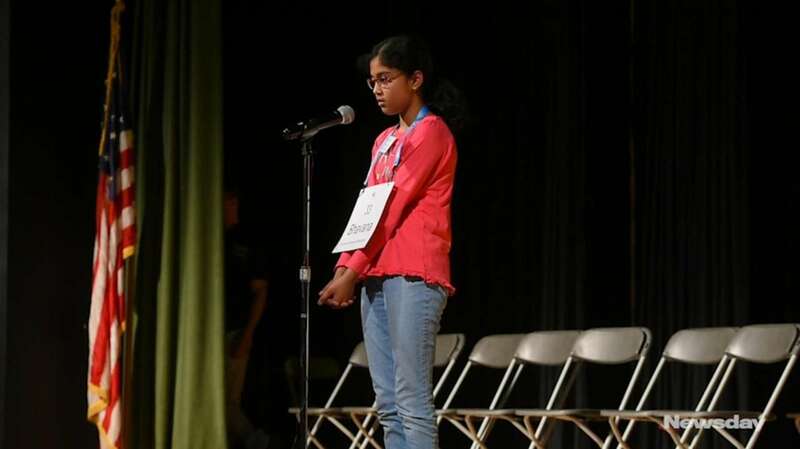 Bhavana competed against 46 other spellers in nine rounds of competition and now advances to the finals with an all-expenses-paid trip to the 2019 Scripps National Spelling Bee in National Harbor, Maryland. About 500 students are expected to take part in the competition, which takes place from May 26 through the 31st. Teachers Federal Credit Union will cover the costs of lodging for Bhavana and her parents. "I knew the word and I was so excited," Bhavana said after the competition. "My mom and dad, they get me a lot of tools and they test me." For more than two hours Wednesday, student spellers from 47 schools across Nassau and Suffolk counties walked to the microphone on stage to spell words that grew more difficult as the rounds progressed. Some of the first-round words included "prodigal," "virtuosa" and "monotonous." In the second round, some of the words were "chary," "virgule" and "egregious." By the fourth round, spellers were asked to master the words "weevil," "placidly" and "plasticity." A ring of the bell meant a word was misspelled and the contestant was out. By round nine, only Bhavana and Keara Schneck, 13, of Blue Point, and an eighth-grader at James Wilson Young Middle school, remained. Keara missed the word "arepas" — grilled cornmeal cakes in Latin American cuisine — but she was still thrilled with her second-place finish. "I have never gotten this far before, and now I am just so happy to come all the way out here and get second place," she said. Bhavana had to spell "allision" — the running of one ship on another ship that is stationary — before getting a shot at the championship word. "She's a natural speller," said her father, Vijay Madini. His daughter spends a few hours on spelling almost every day. The Scripps National Spelling Bee is facilitating this year's Long Island competition with support from Discover Long Island and St. Joseph’s, but this is a temporary solution. Since 2012, Hofstra University in Hempstead had sponsored the event but school officials said scheduling conflicts prevented them from hosting the Bee this year. For 2020 and beyond, organizers are looking for a new host and sponsor. The students were selected from 109 schools. Winners from those school spelling bees completed a 50-word online test to determine who advanced to the Final Local Bee. The contest was open to students through the eighth grade. "This spelling bee is a step between the school spelling bee and the National Spelling Bee. Just getting here to this regional competition is a huge achievement and that means they won their entire school and they came together to compete against each other but more important than that — to compete against the dictionary," said Corrie Loeffler, editorial director with the Scripps National Spelling Bee who also served as announcer for the event. Some spellers will still have an opportunity to compete in the national finals under a program launched last year called "RSVBee." To be eligible, students must attend a school that is enrolled in the Scripps National Spelling Bee program. They must also have been a school or community spelling champion during the 2018-19 school year. Last year, more than 230 students competed in the national finals through RSVBee, including the 2018 champion, according to Scripps. "They actually have a chance to go the national competition even if they don't win here today," said Loeffler.